Vicar of Prestbury from 1974 to 1994, Fr Ian will long be remembered with thanksgiving by so many individuals and families for his faithful pastoral care. His spiritual guidance and counsel was sought after by people from near and afar. Fr Ian believed passionately in the importance and riches of the catholic tradition within the Church of England. He maintained this strong tradition within the worship and life of this parish, and proclaimed it within the Diocesan and General Synods of the Church. He was a great trainer of curates, who learnt personal and priestly spirituality by his example and teaching. Many people today in parishes all over the country have reason to give thanks for the faithful care of their priests who were grounded in the faith by Fr Ian. His distinguished ministry was recognised in 1988 by his being made an honorary canon both of Gloucester and of Wangaratta, Australia. Constantly at Fr Ian's side throughout was his wife, Helen. We offer Helen and the family our love and prayerful support. On Saturday 6 September we shall give thanks for Fr Ian at a Requiem Mass in St Mary's at 11am when the principal celebrant will be his son, Fr William Hazlewood. 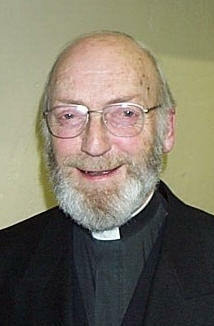 The preacher will be Fr Nicholas Setterfield, the last curate Fr Ian trained. Reg served God faithfully and with profound humility here in Prestbury for over forty years, in many roles including being Churchwarden. His life was centred on the Eucharist. He was server for countless years. Right up to the end of his life he was faithful in Bible reading and in his prayers in which he upheld us all. Reg was still forward-looking even in his 90s: never complaining about change, he was unfailingly interested and supportive of all that we attempt within the worship of God and in church life. We think of his unfailing courtesy, and his support of so many friends. His genuine love of children was exemplified by his support of Rockers over the years. Reg was thrilled to receive the Royal Maundy at the Cathedral earlier this year. Despite his frailty he was determined to survive long enough, and to meet Her Majesty the Queen - which he did with the help of good friends. In one weekend we gave back to God two spiritual giants in Fr Ian and Reg. It is impossible to do justice to either of them in one brief article. In our next magazine we should love to record any memories and thanksgivings you may like to share. Sunday School and Sunday Club resume during the services on 14 September, St Mary's at 11am, St Nicolas' at 9.20am. We look forward to seeing you all again. At long last we will be holding another of our popular Activity days for the children of the Parish. The theme this time centres around the life of Moses. A number of exciting workshops will explore the life of the Israelites during their escape from Egypt and their time through the Exodus. There will only be 100 places and the registration slips will be sent out during the first two weeks of September on a first come first served basis. So if you require a place a swift response will be necessary!! For further details contact Linda Biggs. Synergy and Elevate restart on Sunday, 7 September and The Space on Thursday, 11 September, all at their usual times. Many thanks to all those adults and young people who participate with such energy, care and commitment. Please continue to pray for the young people in the parish. Many thanks to Judi and Hilary, who have run Rockers informally and very successfully throughout the summer holiday. Our new term starts on Thursday, 11 September in St Mary's church at 2pm. Do bring your pre-school children to this relaxed service: songs, bible stories, toys and a cup of tea. We finish in plenty of time to get to school to collect older brothers and sisters. If you would like your child to be prepared to receive communion (before confirmation), please speak to Fr Michael or to Linda Biggs. Children must be baptised, in Year 3 or above as at 1 September 2003, and ideally members of Sunday Club or Sunday School. A meeting will be arranged during September to answer any questions, discuss the preparation programme and agree a starting date. September sees the final of the guest speakers we have enjoyed during the summer season. Marcus Steel will be sharing thoughts on his experiences as a Christian in the world of business on Wednesday 10th. Towards the end of the month we will have the final episode in our series of studies based on the 'I am' sayings of Jesus in the gospel of St John. This will be on Thursday 25th September. Both events start at 8pm. We would be delighted to welcome you to either or both of these evenings. I'd like to say a public and heartfelt thank you to the many people who have been generous enough to speak at these summer meetings or to lead the various studies or have offered us their homes and kind hospitality. The feedback I have received leads me to believe that those who have experienced the series, or part of it, have felt it was time well spent. I'd be happy to hear from you if you have an idea for us to consider as a group. Watch for details of October in the weekly newssheet. A member of our congregations has kindly offered her home as a venue for a church based group to meet, probably weekly, on Tuesday evenings, to chat about a poem or reading or a holiday or other experience. Is there anybody out there who likes the sound of this? It probably will be informal with no specific leader or particular agenda, rather a forum for a few people to meet and discuss something. Do get in touch with someone from the MLT if you want to know more. William left Rockers last November to travel round the world with his parents. The first part of the trip took in Thailand, Hong Kong, Singapore, Tasmania and Australia, where he celebrated his fourth birthday. Then came three months' trekking in New Zealand. William spent Palm Sunday in Nelson cathedral where he was able to participate with the local children in the celebrations. Easter weekend he was in Napier cathedral on North Island, where he processed up the cathedral with all the other children. As it was a Bank Holiday weekend there was a Buick Festival and William was able to see some really old cars dating from the 1920s, 30s and 40s. On another day he went to the Bay of Islands and on the way saw the massive Kauri trees, over 2000 years old and absolutely beautiful, well worth the trip. Then it was time to sell the car and head for the USA, on a long flight to Los Angeles. First a couple of days at Disneyland, including the famous parade and fireworks display which was wonderful. Then inland to the Kings Canyon and Sequoia National Parks, with wonderful scenery and more fantastic trees. There was still a lot of snow around and William really enjoyed the novelty. He and his dad repaired a snowman and they all had a lot of fun. Then they travelled to the San Francisco area to stay with friends who have a high fence to keep turkeys and deer out of their garden! William discovered S'More: chocolate and melted marshmallow in a cracker sandwich!! In nearby Muir Woods William walked amongst coastal redwood trees. It was interesting to compare them with the sequoias and NZ kauri trees. The sequoias especially were eye-catching as they don't die, they just keep growing until they fall over, and they have so much tannin in them that they hardly decompose. William also saw the Golden Gate Bridge, and on another day posed for a photo whilst straddling the San Andreas Fault, one foot on the continental plate and the other on the pacific plate. Then there was a visit to Hollywood, where William climbed on the stage at the Hollywood Bowl and sang Bob the Builder! After encounters with the weird looking fish at Seattle's Pike Place Market, the massive Boeing factory (the largest building in the world) and JFK's Air Force One, William and his family travelled on to Vancouver in Canada. In British Colombia they toured the Canadian Rockies, including a quick day trip visit to the luxury resort of Banff and an overnight stay in a backpackers hostel in the modern custom-made town of Whistler. They also had a lovely time staying in a log cabin by a thermally heated swimming pool filled by mineral water. They found out about the lifestyles and hardships 'enjoyed' by the early pioneer families and were particularly interested in learning about how the railways opened up the western provinces. Originally there had been fatal accidents caused by runaway trains finding the steep mountainsides too much of a challenge. In one place, the railway was later forced through a series of tunnels, forming a figure of eight, to enable it to negotiate what had been an especially treacherous descent. Modern trains pull up to 200 freight containers, stacked double-decker and are so long that the front of the train comes out of the miles-long tunnels before the end has entered! There were a few exciting encounters (thankfully from the safety of the car) with black bears and a foraging grizzly bear with her cubs, before William and his family returned to Vancouver. A quick visit included a trip to Stanley Park for views of the picturesque sunset reflections on the surrounding mountains and over the beautiful harbour where container ships were being loaded with ores and wood products for export all over the world. Vancouver is bidding for the 2012 Winter Olympics and, for scenic location, it must be one of the strongest contenders. A quick stopover in SARS affected Toronto to visit his granddad finished off a wonderful trip and then William and his parents returned to the UK to a lovely family welcome at Heathrow. Safe and well. We were delighted to welcome William back to Rockers at the end of June. His hair was fairer and he was noticeably taller, but he joined in with everything as if he had never been away. This month, of course, he really will leave us, and we wish him all the best as he starts school. PS from William's Mum: Thank you to everyone for all your prayers and, especially to William's friends from Rockers and St Nicolas Sunday Club, for keeping in touch whilst we were away. It is lovely to be back, safe and sound, and to catch up with all our friends again. If anyone wants to visit any of the places we travelled to and would like to know more, please contact us through the Parish Magazine. Reg Legg was Deputy head at Charlton Kings Secondary School and Organist and Choirmaster at St Mary's Church, Charlton Kings, before being ordained in June 1963. At that time there was a small but very faithful congregation at the 'Mission Hut' on Swindon Lane, but the building of the Cleevelands and Paddocks estates had greatly swelled the number of potential worshippers and Reg was appointed by Father Kent as a curate with special responsibility for developing the church's work in this end of Prestbury parish. He and Hazel arrived with their young family and we experienced a kind of whirlwind. Reg's energy and commitment were astonishing: he visited practically every home and persuaded or cajoled people into action. The Sunday School held Family Services which were so well attended that he was able to initiate a 9.30 sung Eucharist, with a choir of seven boys trained by Reg himself and Joan Bell, who played the harmonium and the piano before we acquired an organ. The choir was joined by George Bell and Frank Merrett and other men and it greatly enhanced our worship. A Young Wives' Group, sponsored by Prestbury Mothers' Union, and a Youth Club were founded. Brownies, Guides, Cubs and Scouts were soon to follow. In 1964 a temporary classroom from a school in the diocese became available and it was used to extend the church. All the work was done by the men of the parish, ably led by our Warden, Cecil Dymock, and his father-in-law, William Holbrook. The 'new' building was dedicated as St Nicolas' Church by the Bishop of Tewkesbury on 1st June 1964. Reg left us in January 1966 to become Vicar of Milnsbridge in Yorkshire. He was followed at St Nicolas' by Father Michael Vooght, who carried on his work with equal devotion, but a different style! Canon Kent was convinced that it was time to build a permanent church at St Nicolas' when the Wyman's Brook Estate was built and he and Father Michael set up a committee to raise money and appoint the architect, David Yates. Reg was invited to preach at the opening of the present building in 1970. I regret to say that I cannot recall his text, but his message was clear: 'Unless the Holy Spirit is here you might as well call in the bulldozers now!' He was never one to mince his words... I am glad to say that he loved to have news of the Prestbury church family and wrote to say what happy memories he had shortly before his death in June this year. After Milnsbridge Reg spent seven years as a highly successful Missions to Seamen Port Chaplain at South Shields and Manchester and then found landfall again at Methwold in the diocese of Ely, a somewhat rundown Fenland Parish which he galvanised into action with his usual enthusiasm, where his activities included organising a musical festival and serving as Rural Dean. For his last incumbency he returned to Gloucestershire, where, based at Dymock and with three other parishes, he pioneered a Local Lay Ministry scheme before these became fashionable and, under Bishop John Yates, became Bishop's Adviser on Local Ministry. Bob Lyle and Jim Moore, our churchwardens at the time, who had known him as a Curate, attended his institution at Dymock. The Dymock family from Prestbury also saw Reg at Dymock in 1985, when the millennium of the first church at Dymock was celebrated. 500 people with the surname 'Dymock' or a variant of it were invited. Reg and Hazel retired to Swanage and later to Eastbourne, where the four children and five grandchildren could reach them more easily during Reg's last illness. Reg and Hazel have always kept in touch with friends from Charlton Kings and Prestbury and Hazel was very appreciative of our prayers for Reg and of the letters and messages of sympathy that she received. Last year I forgot to take my camera, so that was a priority this year. I took photos all round from the top of the grandstand, especially across towards Prestbury. I also discovered the Panoramic Restaurant/Café up there on Level 5 which housed the Spiritual Directors' team and was designated 'Soul Space'. I attended a couple of workshops there during my two days, and also found myself drawn up there whenever I had spare time, climbing the stairs every time except the last, when I used the glass fronted lift. Quite apart from the spectacular views over Prestbury in one direction and across to the Malverns in the other, it was just so blissfully quiet. There were books to read, Celtic designs to colour, prints of biblical paintings from the National Gallery to look at, shells to play with, poems to think about, rosaries and crosses to hold, candles to light. I decided to go to the introductory talk on Spiritual Direction, which was in one of the outdoor venues. Unfortunately I missed the first fifteen minutes and when I arrived I found most of the audience lying on the grass with their eyes shut! I think they were doing relaxation exercises in an attempt to slow down and become more open to their inner selves. At the end of the session the team introduced themselves and invited us to the workshops or to chat privately upstairs in the 'Soul Space'. I also went to two Sign Language workshops; Saturday's teaching us how to greet people and Sunday's showing us some Christian worship signs. Good fun, and quiet! Even our applause for the 'speaker' had to be in sign language, rather than the usual noisy hand-clapping. On Saturday I stayed late to see and hear the South African youth band Umoja. Their singing was vibrant and loud, their dancing very energetic. I enjoyed their performance, and again at the Communion service the next day. There were many bands playing all over the place, some inside the grandstand (but audible outside), others on the large outdoor stages, and there was music in many of the tents around the Greenbelt 'Village'. But I must admit my favourite was the classical concert, a proper symphony orchestra playing real music (well, my type of music!). There was no camel this year, but there were people building a wooden frame house similar to ones being funded in Chile. The inflatable church was there too, fun to see but rather noisy inside because of the constant blowing air. Last year I spent only one day at Greenbelt, so this year I went on Sunday as well for the Communion service. There were an estimated 15,000 people present. Two tiers at one end of the grandstand were packed, as was the grassy area in front. Trade Justice was the theme and the prayers were angry. For the Communion we formed groups of about twenty, who shared a slice of bread and a cup of wine. Much later on Sunday evening, there was another opportunity for quietness - an Anglo-Catholic Mass in the USPG tent. The celebrant was South African and spoke several sections of the service in Afrikaans, although we always replied in English. It brought home the fact that God understands us, whatever language we use. We will celebrate the Patronal Festival this year with a United Sung Eucharist in St Mary's at 11.00am. The Bishop of Gloucester will preside and preach on his last visit to us before he retires. During the Eucharist the Bishop will formally licence Fr Stephen as Team Rector and Fr Michael as Team Vicar. As this is a Eucharist for the whole Benefice, there will be no 9.30am Eucharist at St Nicolas' and no 10.30am Eucharist at All Saints' on this day. (There will be a Said Eucharist at 8.00am in all three churches). Following the Eucharist, you are invited to bring a picnic lunch to the Rectory garden in Prestbury. Drinks will be provided. This will be celebrated with a Sung Eucharist on Monday 29th September at 7.30pm in All Saints' Church. Please join us. The September Bake Stall falls on Sunday, 21 September for contributors with surnames N-Z. The proceeds will be sent to the Liberia Crisis Appeal launched by the Disasters Emergency Committee. Please do support this. We have sent the £100 needed to buy a herd of goats for East Africa! This was made up of contributions from the Bake Stall, the Sunday refreshments and Thursday morning coffee. Have you seen the acknowledgement letter in the Church porch? The 21st Sponsored Ride/Walk will take place on Saturday, 13 September. Churches and chapels of all denominations will be open across the diocese between 10am and 6pm, so you can plan your route through the town or across the countryside, visiting as many or as few as you like. If you are unable to participate, then please consider sponsoring someone else. Half the money raised goes to our own churches, the other half to the Trust to help any church in the diocese. Further details are available from Bob Lyle or Nigel Woodcock or Brian Wood. The next concert will take place in St Mary's church on Wednesday, 8 October and will feature piano, violin and 'cello music performed by three senior music scholars from Dean Close School. Coffee and biscuits will be served from 10.30am and the music will start at 11 o'clock. There will be a retiring collection in aid of church funds. All are welcome.